Elnora Snyder was born circa 1871 at Illinois. Leander Snyder was born circa 1873 at Kansas. He was the son of William Morgan Snyder and Elizabeth Jane Waggoner. Married Name Her married name was Dorris. Sarah Josephine Snyder was born circa 1875 at Kansas. Name Variation M. Adaline Roberts was also known as Adeline. Married Name 4 March 1873 As of 4 March 1873,her married name was Vernon. M. Adaline Roberts was born on 20 December 1858 at Texas. She was the daughter of J. G. Roberts and F. H. (?). M. Adaline Roberts married John David Vernon, son of John Vernon and Nancy Harriett Diserens, on 4 March 1873. M. Adaline Roberts died on 25 April 1888 at age 29. [S246] U.S. Federal Census 1880 U.S. Federal Census, by Ancestry.com, NA Film Number T9-1318 Page Number 346D. J. G. Roberts was born at Tennessee. He married F. H. (?). F. H. (?) married J. G. Roberts. F. H. (?) was born at Texas. Name Variation Mary Emily Sikes was also known as Sykes. Married Name 29 October 1884 As of 29 October 1884,her married name was Vernon. Mary Emily Sikes was born on 23 August 1862. She was the daughter of Wm. M. Sikes and E. M. (?). Mary Emily Sikes married John David Vernon, son of John Vernon and Nancy Harriett Diserens, on 29 October 1884. Mary Emily Sikes died on 18 April 1890 at age 27. Wm. M. Sikes married E. M. (?). Married Name Her married name was Sikes. E. M. (?) married Wm. M. Sikes. Gordon Thompson was born circa 1899. He married Grace L. Thurtell, daughter of Frank Thurtell and Eva S. Minnick, on 30 November 1922 at Minnehaha, South Dakota, The South Dakota Marriage Certificate Index for 1905-1949 found on ancestry.com in August 2004 shows that Grace Thurtell, age 24, gender female, married Gordon Thompson, age 23, gender male, on November 30, 1922, in Minnehaha County, South Dakota. Grace's county of residence is shown as Sioux County, and her Post Office is shown as Hawarden, Iowa. Gordon's county of residence is shown as Minnehaha County, South Dakota, and his Post Office is listed as Sioux Falls, South Dakota. Arthur Morris Carlson was born circa 1892. Agnes Barnard was born after 1912. She was the daughter of Milton Barnard and Lillian Jorgesen. Name Variation Adolph Eggen was also known as Egger. Name Variation Adolph Eggen was also known as Eggan. He was the son of Gabriel Eggen and Lovise J. Andersen. Adolph Eggen died in September 1969 at age 68. Adolph Eggen obtained US Social Security Card at South Dakota; last residence Phoenix, Maricopa, Arizona. [S9] South Dakota, South Dakota Birth Records South Dakota, State File Number: 771376 (unknown file date). Judin Solbue was born on 1 September 1918. He died in October 1981 at age 63. Judin Solbue obtained US Social Security Card at California; last residence Alcester, Union, South Dakota. Joyce Maurine Fedderson was born on 30 August 1921 at South Dakota. She was the daughter of James Fedderson and Anna Johnson. Joyce Maurine Fedderson died on 25 June 2010 at age 88 Joyce Sommervold was born August 30, 1921 in rural Beresford, SD to parents James and Anna (Johnson) Fedderson. 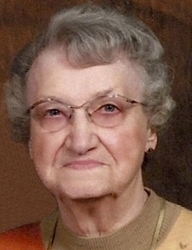 She died June 25, 2010 at Bethesda Nursing Home in Beresford at the age of 88 years, 9 months and 25 days. Joyce attended Brule rural school and graduated from Beresford High School. 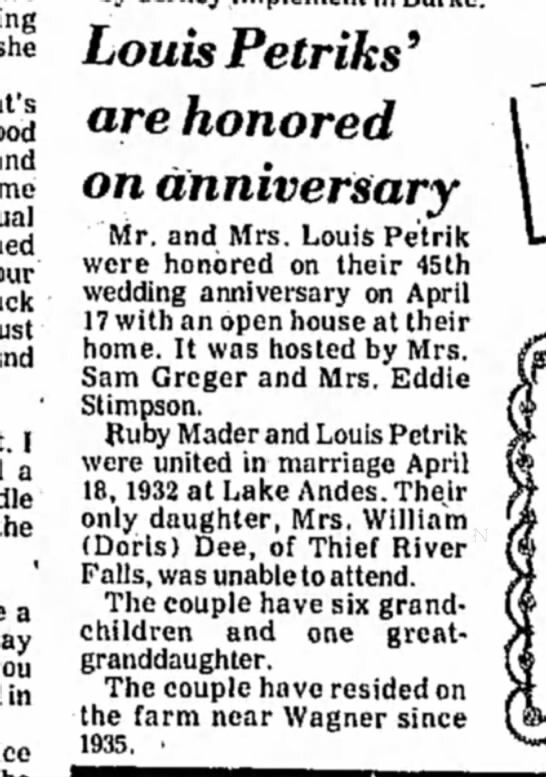 She married Marvin Sommervold on August 31, 1940. The couple resided most of their married life on a farm south of Beresford where she stayed busy as a mother and homemaker. She also worked for the City of Beresford for 3 years. The couple moved into town four years ago. 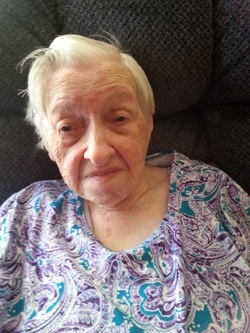 Joyce became a resident of Bethesda Nursing Home in December of 2009 and has lived there until the present time. Joyce was baptized and confirmed at St. Paul Rockfield Lutheran Church and later became a member of Roseni Lutheran where she was involved with the Ladies Aid, Bible study and the quilting group. Her hobbies and interests included gardening, sewing and being a wonderful cook. She was preceded in death by her parents, grandson Brian, sister Alta Peterson, brother Kenneth Fedderson, a sister Delores in infancy, sisters-in-law DeVonna and Clarice Fedderson, brothers-in-law Robert Postin and Franklin Peterson, and grandson-in-law Matt Kleinhesselink. Her survivors include her husband Marvin Sommervold of Beresford three sons, Merlyn Sommervold and wife Sherran of Chancellor, Arvid Sommervold and wife Debra of Brookings, and Steven Sommervold and wife Carol of Alcester; 8 grandchildren, Brent (Cheryl) Sommervold, Bonnie Kleinhesselink and fiance John, Barry (Tina) Sommervold, Angela (John) Maher, Susan (Adam) Forma, Mark Sommervold, Matt (Jessica) Sommervold, and Chad Sommervold and fiance Brianna; 11 great grandchildren, Mitchell, Britney, Wyatt, Justice, Jersey, Brayden, Lexi, Jordan, Max, Natalie and Jordan; a sister Ardis Postin, Cheyenne, WY and a brother Clayton Fedderson, Beresford; and many nieces, nephews, relatives and friends. Funeral services will be 2:00PM, Monday, June 28, 2010 at Roseni Lutheran Church, rural Beresford with burial at the church cemetery. Visitation with family present will be Sunday from 6PM to 8PM at Wass Funeral Home in Beresford. [S250] U.S. Federal Census 1930 U.S. Federal Census, by Ancestry.com, Year: 1930; Census Place: Emmet, Union, South Dakota; Roll: 2232; Page: 5A; Enumeration District: 10; Image: 156.0. Helen Irene Loftesness died in May 2001. Marvid A. Stoen was born on 24 October 1910 at South Dakota. He was the son of Olaus J. Stoen and Marie Lundly. Marvid A. Stoen died on 9 October 1995 at age 84. Marvid A. Stoen obtained US Social Security Card at South Dakota; last residence Alcester, Union, South Dakota. [S250] U.S. Federal Census 1930 U.S. Federal Census, by Ancestry.com, ED10. Dwelling 130. He was the son of Erick Wevik and Hannah Leer. He was buried after 8 March 1986 at Roseni Lutheran Church Cemetery, Beresford, Union, South Dakota. Newton Hilman Wevik obtained US Social Security Card at South Dakota; last residence Beresford, Union, South Dakota. [S9] South Dakota, South Dakota Birth Records South Dakota, State File Number: 797175 (unknown file date). [S184] Beresford Republic Newspaper, Vol. 92-93, 1986 Mar 13. [S244] U.S. Federal Census 1910 U.S. Federal Census, by Ancestry.com, ED114. Dwelling 34. [S243] U.S. Federal Census 1920 U.S. Federal Census, by Ancestry.com, ED250. Dwelling 107. Name Variation Ina Avenelle Sylliaasen was also known as Ina Avenile. Ina Avenelle Sylliaasen was born on 4 April 1921 at Volin, Turner, South Dakota. She was the daughter of Olaf Martin Aune and Anna O. Haugen. Ina Avenelle Sylliaasen died on 9 May 2017 at age 96 Ina Avenile Lykken, nee Sylliaasen, age 96, of Schaumburg, IL, died peacefully at her home on Tuesday, May 9, 2017. She was born April 4, 1921 in Volin, South Dakota to the late Arthur and Ida Sylliaasen. 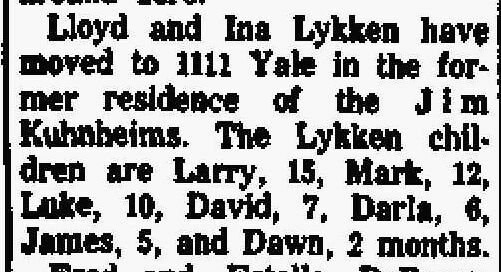 She grew up in the home of her Aunt Anna and Uncle Olaf Aune, whom she called Ma and Pa. She married Lloyd Eldon Lykken on June 27, 1942. To that happy union were born seven children. She worked by cleaning homes and a soda jerk in New Jersey. She also worked at the Lutheran Home in Arlington Heights. She was a wonderful, beautiful, loving, caring wife, mother and grandmother who taught her children about the love of Jesus. She loved her family immensely. She always put her family first. She was an excellent baker and cook, always making delicious meals and special treats for her family. She loved to crochet, knit, sew, embroider and read. She was faithful going to church. She loved singing in church, listening to God’s word and seeing her church family. Prayer was a big part of her life. She always said “Loving Father care for me.” Ina’s favorite color was blue. She loved ice cream and soup. She always looked beautiful and yellow was a wonderful color on her. She loved extra thick malts, chocolate and Coco Balls from Fannie May were her favorite. She loved tuna and rueben sandwiches and her homemade chocolate meringue pie. She made the best homemade macaroni and pinwheel cookies. She loved to crochet and made many afghans for her children and grandchildren. Ina loved collecting angels which were displayed throughout her home. She loved celebrating birthdays and holidays with her family. Her favorite hymn was “In the Garden.” She was a gentle spirit and always treated everyone she met with love and kindness. She never said negative about anyone. She loved to share laughter with others. She will be dearly missed. Funeral services and interment will be Saturday, May 20 at Trondhjem Lutheran Church, Volin, SD. Visitation will be at 10 a.m. and funeral will follow at 11 a.m.
Ina was the beloved wife of the late Lloyd Eldon Lykken; devoted mother of Mark Lykken, Luke (Heidi) Lykken, Pastor David (Roselyn) Lykken, Darla (the late Mark) Prentice, James (Michelle) Lykken, Dawn (Kevin) Schlueter and the late Larry (Sandy) Lykken; caring grandmother of Kristina, Erika, Gwen, Nathan, Lloyd, Kristian, Emily, Lukie, Roy, Tyler, Jennifer, Joy, Jamie, Joshua, Jessica, Sanja and the late Christopher and Easton; loving great-grandmother of Aria, Emma, Maximus, Claire, Keira, Averli, Annaliese, Jordan, Courtney, Aneesa, Jazmyn, Isaiah, Everett, Jeff, Rae and James; dear sister of the late Mildred, Eleanor, Opal and Eline. 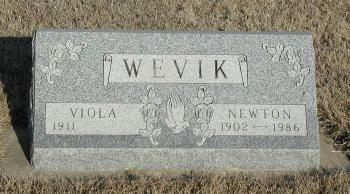 She was buried after 9 May 2017 at Trondhjem Cemetery, Volin, Yankton, South Dakota. Mother died in 1924. Raised by aunt and uncle. 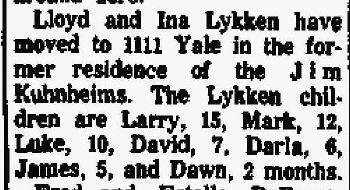 Ina Avenelle Sylliaasen and Lloyd Eldon Lykken lived in December 1961 at 1111 N Yale Ave, Arlington Heights, Illinois. [S250] U.S. Federal Census 1930 U.S. Federal Census, by Ancestry.com, ED17. Dwelling 94. [S373] U.S. Federal Census 1940 U.S. Federal Census, by Ancestry.com, Year: 1940; Census Place: Walshtown, Yankton, South Dakota; Roll: T627_3870; Page: 3A; Enumeration District: 68-17. Name Variation Odell Berg Johnson was also known as Odell Johnson Berg. Odell Berg Johnson was born on 14 July 1913 at Montivideo, Minnesota, also reported as 14 Jul 1914. He was the son of Albert Berg and unknown (?). Odell Berg Johnson died on 25 January 1969 at age 55 Services for Odell B. Johnson, 55, were conducted by the Rev. Carl Holm at the Canton Lutheran Church. Tuesday, January 28. Mr. Johnson died at the Canton - Inwood Hospital on January 25. Interment was at the Canton Lutheran Cemetery with Anderson Funeral Home in charge of arrangements. Pallbearers were Lynn Aasheim, John Temple, Ronald Aasheim, Fred Schrodmeier, MiltonCole, and William Larson. Honorary pallbearers were Emil Groon, Herbert Groon, Henry Aasheim, Albert Olson, Delmer Klostegaard and Jerald Groon. Mrs. Kermit Helgerson was the organist and the soloist was Harold Ver Steeg. Odell B. Johnson was born July 14, 1913 at Montivideo, Minn. His parents were Mr. and Mrs. Albert Berg. On December 6, 1934 he was married to Bernice Groon. Following their marriage they lived at Alcester, Parker, and Hurley before moving to Canton in 1961. Mr. Johnson was a jeweler. His is survived by his wife, Bernice, one daughter Mardell, Mrs. Darrell Husby of Vermillion; one son, Merlynn of Canton; and four grandchildren. Odell Berg Johnson obtained US Social Security Card at South Dakota; last residence Canton, Lincoln, South Dakota. [S243] U.S. Federal Census 1920 U.S. Federal Census, by Ancestry.com, Year: 1920;Census Place: Norway, Lincoln, South Dakota; Roll: T625_1722; Page: 2A; Enumeration District: 143; Image: 849. [S250] U.S. Federal Census 1930 U.S. Federal Census, by Ancestry.com, Year: 1930; Census Place: Norway, Lincoln, South Dakota; Roll: 2226; Page: 5B; Enumeration District: 20; Image: 752.0. Delmar T. Klostergaard was born on 31 October 1920 at South Dakota. He was the son of Martin Lauritsen Klostergaard and Hazel (?). Delmar T. Klostergaard died on 19 July 1998 at age 77. He was buried after 19 July 1998 at Pleasant Hill Cemetery, Alcester, South Dakota, Service Info. : WT3 US NAVY WORLD WAR II. Delmar T. Klostergaard obtained US Social Security Card at South Dakota; last residence Parkston, Hutchinson, South Dakota. [S250] U.S. Federal Census 1930 U.S. Federal Census, by Ancestry.com, ED14-3. Dwelling 68. Name Variation Nina Elva Thayer was also known as Wina. Nina Elva Thayer was born circa 1913 at South Dakota. She was the daughter of Orson Monroe Thayer and Rose Mabel Rolfe. Nina Elva Thayer died on 21 December 1943 at Union, South Dakota. [S243] U.S. Federal Census 1920 U.S. Federal Census, by Ancestry.com, ED246. Dwelling 75. [S250] U.S. Federal Census 1930 U.S. Federal Census, by Ancestry.com, ED17. Dwelling 14. Henry Linnford Aasheim was born on 24 August 1912. He was the son of Ole L. Aasheim and Margarette (?). Henry Linnford Aasheim died on 24 October 1995 at age 83. Henry Linnford Aasheim obtained US Social Security Card at South Dakota; last residence Canton, Lincoln, South Dakota. Katherine Geilfus was born circa 1920. Name Variation Reuben F. Bechen was also known as Ruby. Reuben F. Bechen was born on 20 July 1895 at Orter Creek, Iowa. He was the son of Nicholas Bechen and Nellie F. O'Rourke. Reuben F. Bechen witnessed the death of Bernard Nicholas Bechen on 14 August 1926 at at brother Reuben's house, Belvidere, South Dakota; Nick Bechen, 14, killed by lightening. Reuben F. Bechen died on 31 October 1982 at age 87. Reuben F. Bechen obtained US Social Security Card at South Dakota; last residence Artesian, Sanborn, South Dakota. [S245] U.S. Federal Census 1900 U.S. Federal Census, by Ancestry.com, ED125. Dwelling 141. [S244] U.S. Federal Census 1910 U.S. Federal Census, by Ancestry.com, Year: 1910; Census Place: Darlington, Charles Mix, South Dakota; Roll: T624_1478; Page: 5A; Enumeration District: 86; Image: 149. [S243] U.S. Federal Census 1920 U.S. Federal Census, by Ancestry.com, Year: 1920; Census Place: Darlington, Charles Mix, South Dakota; Roll: T625_1717; Page: 10A; Enumeration District: 36; Image: 593. [S250] U.S. Federal Census 1930 U.S. Federal Census, by Ancestry.com, ED36-2. Dwelling 4. [S373] U.S. Federal Census 1940 U.S. Federal Census, by Ancestry.com, Year: 1940; Census Place: Belvidere, Jackson, South Dakota; Roll: T627_3858; Page: 1B; Enumeration District: 36-2. Name Variation Louis H. Bechen was also known as Lewis. Louis H. Bechen was born on 29 September 1898 at Iowa. Louis H. Bechen died on 29 June 1982 at Vail, Crawford, Iowa, at age 83. He was buried after 29 June 1982 at Saint Anns Cemetery, Vail, Crawford, Iowa. Louis H. Bechen obtained US Social Security Card at Iowa; last residence Vail, Crawford, Iowa. [S250] U.S. Federal Census 1930 U.S. Federal Census, by Ancestry.com, ED5. Dwelling 61. [S373] U.S. Federal Census 1940 U.S. Federal Census, by Ancestry.com, Year: 1940; Census Place: Township 93 Range 55, Yankton, South Dakota; Roll: T627_3870; Page: 4B; Enumeration District: 68-24. Name Variation Vincent Sejnoha was also known as Sejnoka. Vincent Sejnoha was born on 7 January 1914 at South Dakota. He was the son of James Sejnoha and Catherine Shurtz. Vincent Sejnoha died in July 1981 at age 67. Vincent Sejnoha obtained US Social Security Card at South Dakota; last residence Lake Andes, Charles Mix, South Dakota. Joseph Nicholas Marbach was born on 4 December 1896 at Iowa. He was the son of Mathias Marbach and Minnie L. (?). Joseph Nicholas Marbach died in August 1965 at age 68. Joseph Nicholas Marbach obtained US Social Security Card at South Dakota; last residence Yankton, Yankton, South Dakota. [S245] U.S. Federal Census 1900 U.S. Federal Census, by Ancestry.com, ED84. Dwelling 98. [S244] U.S. Federal Census 1910 U.S. Federal Census, by Ancestry.com, ED441. Dwelling 72. [S250] U.S. Federal Census 1930 U.S. Federal Census, by Ancestry.com, Year: 1930; Census Place: Yankton, Yankton, South Dakota; Roll: 2232; Page: 10A; Enumeration District: 21; Image: 929.0. Louis Petrik was born on 27 July 1898. Louis Petrik died on 20 June 1988 at age 89. Louis Petrik obtained US Social Security Card at South Dakota; last residence Wagner, Charles Mix, South Dakota. 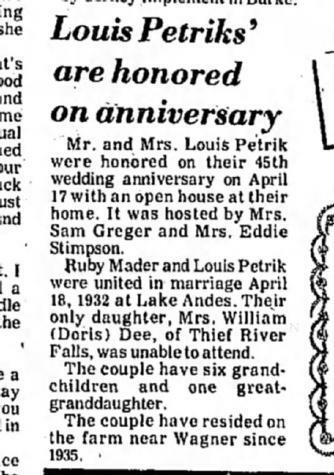 On 17 April 1977 at 45th wedding anniversary.